Smashbox have recently brought out a new range of eyeshadow palettes called “Photo Op Eye Enhancing palettes” which are designed to take the guesswork out of picking the perfect eyeshadow colours to make your eye colour pop. While it is true that wearing contrasting colours (i.e. browns or golds on blue eyes) can really make your eye colour stand out, it doesn’t mean to say that you have to wear only these colours. I recently bought the “Hazel” eye colour palette for my kit and I have to say, the colours look beautiful on blue eyes also, so there are no hard and fast rules on what colours you should or shouldn’t wear. As long as the eyeshadow is applied well you can’t really go wrong with any of these palettes for all eye colours. 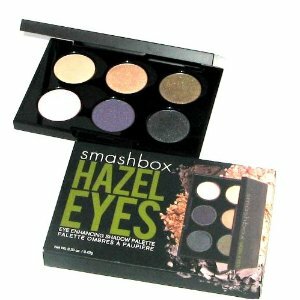 I really love these palettes and they are good value at €39 for 6 colours. The eyeshadow itself lasts and there is a mix of matte and shimmery colours. Nothing is too shimmery which is great cos it means the colours are very wearable for day or night time. I’d highly recommend these and will definitely have to add all of them to my kit!